Get ready to carve up the slopes at Sunday River! Our Boston Ski Bus offers adventurers an escape to the wintry wonderland that is Western Maine. Package options include round-trip transportation from Boston to Sunday River and the option to add on lift tickets and ski/board rentals. Sunday River boasts some of the best powder on the East Coast with natural and man made snow pairing to provide pristine conditions for skiers and snowboarders alike. 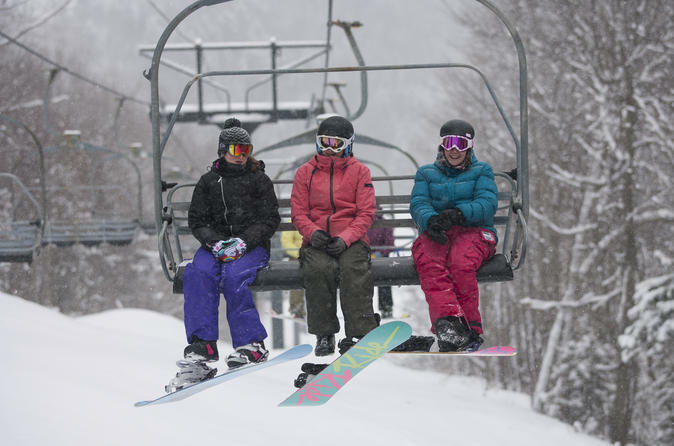 Sunday River is home to eight mountain peaks and an impressive 135 slopes, offering a multitude of different runs that cater for newbies to seasoned skiers. Head to one of our pick-up locations in Boston where you’ll be met by our Boston Ski Bus and one of our charming Guides. Once you arrive at the mountain, lift tickets will be distributed and you’ll be fitted with ski or snowboard equipment, depending on your package. If you’re bringing your own gear, there is plenty of space for skis and snowboards in the storage compartment beneath the coach bus. Next up… the day is yours! Spend the day on the slopes, experiencing the various runs the park has to offer. Hungry? No problem. Sunday River offers a variety of food options including; restaurants, a cafe, coffee shop and food courts. After a full day on the snow you’ll depart the mountain at 4pm!